Currently in a Dietetic Internship at University of Houston, Elizabeth Jarrard is on her way to becoming a registered dietitian with a bachelor's degree from Boston University in nutritional sciences. She is an avid blogger and passionate about nutrition communication. A small, deep purple grape variety, known as the Concord, is the only grape native to North America. Grown originally in Concord, Massachusetts, this little berry has shown promising health benefits due to its high antioxidant content. But is it better than red table grapes? Polyphenols are the type of antioxidants that give Concord grapes their vibrant color. 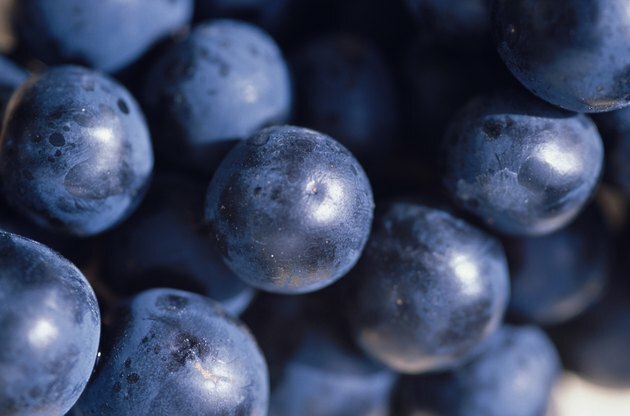 Dark-skinned blue and purple fruits, like the Concord grape, tend to have more natural antioxidant power than their lighter-skinned counterparts, as measured by Oxygen Radical Absorption Capacity (ORAC). This assay measures the degree of inhibition by various foods of free-radical-induced oxidation — how potent their antioxidants are. While both Concord and red grapes have high levels of antioxidants, the deeper color of the Concord indicates that it has a greater capacity to destroy free radicals. While studies directly comparing Concord grapes to red table grapes have not been conducted, Lutz et al. (2011) did find that blue grapes exhibited higher antioxidant capacity than red grapes. Extensive research has been done on Concord grape juice and heart health. It appears that the antioxidants in these grapes help to reduce inflammation in people with heart disease in particular. A 2004 study by Albers et al. found that adults with coronary artery disease who drank Concord grape juice daily for two weeks decreased free radical production and markers of inflammation. The results seen in the lab are similar to those that accompany moderate red wine consumption — but without the added alcohol. The farmer's market is the best place to find Concord grapes. You are more likely to see them in the Pacific Northwest or Northeast regions of the United States. You can also buy Welch's grape juice which is made from 100 percent Concord grapes. Not all grapes juices are made exclusively from Concord grapes, so it is important to look at the label to identify the source. One serving of grapes is one cup, and one serving of grape juice is half a cup. Concord grapes are an antioxidant-rich berry, and, based on their ORAC score, richer than regular table grapes. They may be harder to find in your grocery store, however. Because they still contain seeds and do not store well at room temperature for long periods of time, you may have to buy directly from a family farmer in Washington, New York, Massachusetts or Michigan. While more research is needed on regular grapes, the data we have on Concord grapes suggest they are packed with nutrients, especially antioxidants, which provide many health benefits, from immune-enhancement to improvement of cardiovascular function.